Did the ESDC board members know they were approving a 675,000 sf arena? And should there have been opportunity to comment? It's very curious. When the Empire State Development Corporation (ESDC) on June 23 adopted the 2009 Modified General Project Plan (MGPP), the arena (see Exhibit A-2) was described as 850,000 square feet, as it had been in 2006. On September 9, after the comment period on the MGPP had closed, Forest City Ratner announced that the new design, by Ellerbe Becket and SHoP, was for a 675,000 square foot arena. On September 17, the ESDC Board affirmed the MGPP, with the press release--a collaboration with the developer?--cited "a 675,000 square-foot sport and entertainment complex at the intersection of Atlantic and Flatbush Avenues that will be the home court of the NETS professional basketball team." There was no mention at the ESDC board meeting of a smaller arena. 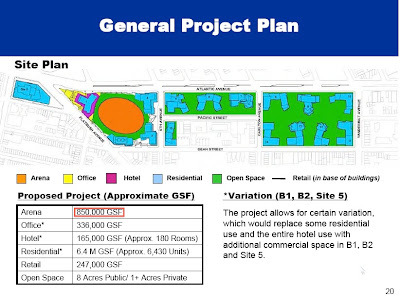 And the project site plan (right) that was part of board documents again stated that the arena would be 850,000 sf, thus contradicting the press release. Clearly no new site plan had been prepared. Was that because of time pressure or because the announcement of such a 20 percent reduction might have prompted--or even required--further public comment and analysis?